Iban (formerly called Sea Dayak) is a Malayo-Polynesian language spoken by nearly 700,000 people in Sarawak (Malaysia), Brunei, and adjacent Indonesia. It is the most widely spoken indigenous language in Sarawak. It is closely related to Malay, the dominant language in Malaysia and Indonesia. As with most languages, Iban has a number of dialects; the texts given here should be understood by Iban speakers living in Malaysia, but possibly not by those living in Indonesia. Portions of the Book of Common Prayer have been translated into Iban from the late 1800's and up to the present day. William Muss-Arnolt discusses earlier Anglican liturgical translations into Iban in Chapter XXXIX of The Book of Common Prayer among the Nations of the World (1914). Two translations are presented here. The first is a fairly complete translation of the 1662 BCP, printed in 1914. It appears in David Griffiths' Bibliography of the Book of Common Prayer 1549-1999 as 28:3. We have the more important services as HTML text (see the Table of Contents below), plus the entire book as PDF graphics. 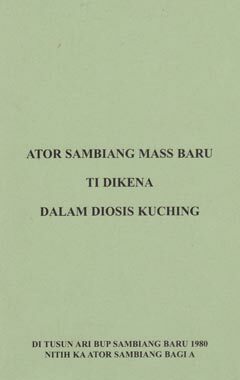 The other is a translation of several orders for the current Province of South East Asia service of Holy Eucharist into Iban, as used in the Diocese of Kuching (basically the province of Sarawak); see the links below on the right. NYADI BISHOP, PADRI, ENGGAU DIKON. Thanks are due to Richard Mammana, who transcribed the Eucharist text from a copy of the 36-page pamphlet provided by the Diocese of Kuching. It is reproduced by kind permission of the Bishop of Kuching. UTAI TI DALAM SURAT TU. l. Baka Mazmur ditaga dibacha. 2. Bacha ti ditaga ka Hari Minggu enggau Hari Kudus lain. 3. Surat Bulan enggau Bacha ka tiap hari. 4. Hari Raya enggau Hari Pasa. 8. Lain Sampi Pinta enggau Sampi Puji. 9. Sampi, enggau Epistola, enggau Injil ti dikena sapemanjai taun. 11. Sambeyang Baptisa Anak biak ti mit. 12. Sambeyang Baptisa Anak Biak ti mit delam rumah. 13. Sambeyang Baptisa Orang ti besai Tuai. 16. Sambeyang enggau Ngabas orang Sakit. 17. Sambeyang enggau Numbak orang Mati. 18. Sambeyang Puji ka Indu ti baru udah Beranak. 19. Sambeyang ti ngenang Ukum orang Penyalah. 21. Ator Sambeyang enggau Masok ka orang nyadi Bishop, Padri, enggau Dikon.